I was able to watch the first three quarters of the Stanford vs Washington game (or Luck vs Locker as it’s become). I’ve just got back home from working in London and will be up early tomorrow (it’s 1:30am here) to return to the city for tomorrow’s Denver vs San Francisco game. However, I wanted to open up this thread as a discussion center for those watching the game or any of the CFB this weekend. Frankly it’s impossible to scout Jake Locker in this situation. Washington’s offensive line has been shambolic. He’s taken a couple of big hits, had almost no time in the pocket and has became jittery. But as bad as Washington’s offensive and defensive lines were, Stanford were the polar opposite. It certainly makes life easy for Andrew Luck – who had an age to throw and is able to lean on a completely dominant run game. Having said that – Luck has cleary made significant strides from the UCLA game. His throws are a lot more restrained, he’s moving the ball well and his accuracy is much improved. He’s nowhere near as erratic despite a similar blow-out. A 51-yard touchdown run from Luck flashed the kind of athletic qualities he has. As a passer he’s milked Washington dry. In my last mock draft I put Luck in San Francisco. That would be an ideal situation. It’s close to his current home, he’ll have a solid young O-line. He’ll be able to lean on a power back (Frank Gore) with two legitimate targets to throw to (Davis/Crabtree). A match made in heaven. Elsewhere, Cam Newton (who will almost certainly declare for 2011 and will be in my next mock) is stamping is name all over the Heisman. He’s caught a TD pass today and thrown a lot more in a beat-down of Ole Miss. I’ve also caught some of Florida vs Georgia. It was interesting to watch Janoris Jenkins (CB, Florida) perform well against AJ Green (WR, Georgia). Jenkins has done a great job this year covering Julio Jones and Green. That’s probably the two elite WR prospects from the 2011 class. He struggled, however, against Terrance Tolliver (WR, LSU) who might be a UDFA or late round pick. The reason? When it comes to pure coverage, Jenkins might be the best corner in next April’s draft. When asked to make open field tackles or confront a big receiver in space, he’s one of the worst. Nevertheless, he’ll go early – teams love corner’s that can cover. Jenkins has elite cover skills. I’ve got games to watch when I get back from London. Expect plenty on the blog Monday. Until then, let me know any thoughts you have in the comments section on this weekends action. I’m going to be in London this weekend for – amongst other things – the game between Denver and San Francisco at Wembley Stadium. I’ve got Miami vs Virginia, USC vs Oregon and Missouri vs Nebraska on record to watch next week. I watched Florida State’s defeat to North Carolina State last night. Nearly every mock draft I see has Christian Ponder (QB, FSU) in the first or second round (example 1, example 2). Personally, I find that astonishing. I go into more detail here but I wouldn’t draft him in the first four rounds. We’re in danger of overstating percevied intelligence off the field and ‘moxie’ and ignoring glaring physical weaknesses and a lack of accuracy. Clearly this is very specific to Max Hall. However, this certainly relates to some of the issues I have with Ponder. He doesn’t have a strong arm, in fact it’s pretty weak. His first downfield pass against North Carolina State last night was a high floaty ball with zero velocity into double coverage. One thing I just don’t ‘get’ with Ponder is the lack of velocity he even puts on his wide receiver screens. The idea of a screen pass is to get the ball quickly to the wide out who can take advantage of soft coverage. When Ponder throws the ball out, it’s almost like he’s concentrating too much in simply hitting the receiver, as it floats out with nowhere near enough zip. The defensive back has more than enough time to read the play, react and make the tackle. His decision making and accuracy have been all over the place in 2010. In the last two games against NC State and Boston College, I counted three times when Ponder took play action, turned to his right only to be greeted by a defensive lineman charging to him. In this situation he has to either take the sack and accept the broken play, try and throw the ball away or make a play with his legs. On each occasion Ponder simply threw the ball straight at the DL allowing the pass to be tipped up into the air. It led to one interception against BC and another similar play for a pick six was called back because of a fortunate false start. This is just one example of the way Ponder tries too hard to force throws. A lot of people talk about his intelligence and leadership. When you hear Ponder in interviews he comes across most personable and clearly switched on. I’ve no doubt he’s a hard worker off the field and studying won’t be an issue at the next level. We need to distinguish between off the field intelligence and on the field smarts. I don’t think Ponder reads the game well enough. There are too many basic errors, too many botched plays. I don’t like Greg McIlroy as a pro-prospect and he’s physically limited. However – you can see he’s ‘game smart’ by the fact he limits his mistakes and simply keeps things ticking over. He manages. Ponder doesn’t. The clearest example of this was the last real play of the game. Florida State had stormed down field into the red zone with seconds left needing a touchdown to win. Play action was the call, but Ponder faked the hand off wrongly to the full back – so when the half back arrived for the ball they collided, forcing a fumble. On three occassions last night, Ponder reacted badly to dropped passes. Admittedly, on all three occassions the ball was on the money and the catch needed to be completed. However – sinking to your knees with your head in your hands after such a mistake is not the way to lead your team. Stats can be misleading in many ways. A wideout like Julio Jones did suffer last year playing in a run-dominant offense. Due to his well publicised ‘drops’, many over emphasised the mental errors – which although they did exist – were not the sole reason for a slight sophomore slump. Some quaterbacks get praised for stats when they play in a pass friendly system. As good as Sam Bradford is, his incredible 50 touchdown Heisman year played some part to the offense he played in as well as his incredible talent. Florida State aren’t a bad team. They’ve defeated Miami and even when their quarterback has played very poorly (vs Boston College) they’ve done enough to win. But I just don’t know what to make of Ponder’s numbers. In eight games, he’s only reached 200+ yards once – against a decidedly poor Wake Forest outfit. He’s ranked only the fourth best QB in the distinctly average ACC. His 13-7 TD/INT ratio isn’t disastrous, but it isn’t that great either. His completion percentage is down from 68% last year to 60% this year. You can make of that what you will. However, scouts will watch the tape from 2010 and see a prospect who just hasn’t performed well enough. Physically limited, not accurate enough to make up for it and hasn’t put up the big numbers despite some weak opponents. He had a second round grade coming into 2010 and hasn’t done anything this year to improve that. I can only see a backup role in the NFL at best. Even then – I don’t think he’ll beat teams physically or with his accuracy. He could well be another Max Hall – struggling to get the ball down field, making basic errors. He’s more athletic than Max Hall for sure, but not in terms of being able to hurt a team. He’ll move around in the pocket a bit more, but he isn’t a good passer on the move and struggles to keep his eyes downfield. But then we come back to the ‘moxie’ and ‘intelligence’. That will never be a good enough reason alone to grade a prospect in round one. It’s why Colt McCoy went in round three (despite a much better CFB career) and probably should’ve gone later than even that. You don’t go the other way and over promote a physical specimen who isn’t switched on (JaMarcus Russell). Ponder is neither physical or accurate enough to deserve the high grade some people have offered. Chad Reuter and Rob Rang from NFL Draft Scout look at the top senior prospects on offense and defense. I don’t agree with Rang that Cameron Heyward is the best defensive end and think he’s another ‘big name’ who’s slightly over rated. Neither Heyward or Allen Bailey (Miami) have great production this year – but Bailey is by far the more physically talented. Note the use of ‘moxie’ in Reuter’s review of Ponder. He does at least appreciate his inability to drive the ball downfield. Walter Cherepinsky publishes an updated mock draft. He has the Seahawks drafting 21st overall in round one and selecting Jake Locker (QB, Washington). I don’t think that’s an unrealistic proposition. I do however disagree with the choice in round two – Kritofer O’Dowd (C, USC). This is too high for O’Dowd, particularly with Stephen Paea (DT, Oregon State) and Rodney Hudson (G, FSU) still on the board. Mel Kiper hosts his weekly web chat. He says he has Florida State’s brilliant guard Rodney Hudson ranked 28th on his big board. He also discusses a number of other big name prospects. A video to finish with. Want to know more about Auburn QB Cam Newton (who appears almost certain to enter the 2011 draft)? 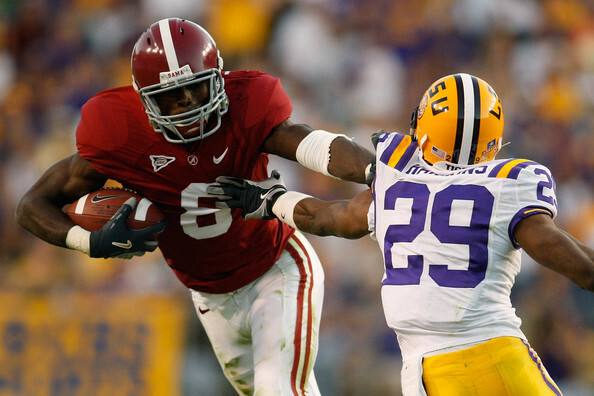 One of the toughest prospects to judge this year is Alabama wide receiver Julio Jones. After an excellent season as a true freshman (924 yards, four TD’s) much was expected from Jones in 2009. He regressed slightly as a sophomore, putting in a number of frustrating performances littered with mental errors and drops. The numbers were down – only 596 yards – and he entered his junior (and likely final) year with the Crimson Tide needing to rekindle his spark. Physically he’s everything you’d ever want in a #1 NFL wide out. He has the height (6-4), the size (220lbs) and the speed to do it all. He blocks well in the running game, he gets down field to stretch a defense. You can use him in the red zone on fades or play action. When I watched him in 2009, I was pretty disappointed. I’m not sure if it was the level of expectation getting to him, but there were too many basic errors. It doesn’t matter how physically elite you are if you have a case of the drops. He only had one +100 yard game last year – largely in part due to a 73-yard touchdown screen against LSU. Part of the problem was Alabama’s run heavy offense which used the pass as a compliment feature. But you couldn’t get away from the drops. I’d originally seen Alabama two times this year – against Arkansas and Florida. A single play from Jones also sticks in the mind from ‘Bama’s opener against San Jose State – a world class one handed grab for a TD which showed the immense talent on offer. Against Arkansas and Florida, I got the impression not much had changed this year with Jones. Alabama ran the ball well and didn’t use their talented receiver a whole lot. There were a couple of sloppy drops against Arkansas. Jones was completely shut down by Janoris Jenkins against Florida – his four grabs for 19 yards only came via dump offs and screens. He was a complete non-factor in a blow-out victory. With such a contrast in rankings, I wanted to spend some time looking at Jones. His performance last Saturday in setting a school record for receiving – 221 yards and 12 catches against Tennessee – made me wonder if finally the production was going to match the potential. I had Alabama’s defeat to South Carolina saved up and ready to watch. In the game, Jones had 118 yard from eight catches and a TD. The first thing I noticed is something that I’ve picked up on before. Jones sometimes has a little dance step at the snap which needs to be removed. It’s not a big issue – Michael Crabtree had exactly the same problem. However, he’s capable of exploding and running really crisp routes and this holds him back slightly. If this was the first time I’d seen Jones and you told me he had issues with drops – I wouldn’t believe you. Apart from one low drop which was all on Greg McIlroy’s terrible throw, Jones’ hands were borderline elite. Everything was plucked out of the air with his hands – no body catching. I don’t rate McIlroy as a quarterback in the slightest – and this was the perfect example why. He struggled to hit a 6-4 target dwarfing over coverage, yet Jones bailed him out with a number of acrobatic grabs. He ran one great route down the middle of the field – this time the throw was on the money. Jones had two defensive backs ready to deliver a crunching hit, but he didn’t hear footsteps and simply completed the pass and took the shot. Impressive. With 40 seconds left of the first half and with Alabama trailing, he feigned to the outside before cutting through a slant in the red zone. McIlroy throws a wild pass high up into the air above Jones’ head. He quickly adjusts and makes a superb, athletic grab for the touchdown despite tight coverage and a hand in the face from the DB. I counted seven occasions when Jones beat his man deep but McIlroy didn’t look for him. The ‘Bama QB might have all the ‘moxie’ and ‘leadership’ in the world, but he makes one read and if it’s not on – takes the sack or throws it away. On every one of the seven occasions he never even looked Jones’ way. If he had, we could’ve been talking about a school record earlier than the Tennessee game. Overall I came away impressed. That was the benchmark from which Jones has to build on – and it’s good to see he’s done so in the next game he saw significant action (injury kept him out vs Ole Miss). His most recent achievements are all the more impressive because he’s been battling a serious hand injury. He’s not a diva, he’s got the attitude you don’t always expect from a talented CFB receiver. If he’s turned the corner and is starting to show a level of performance that matches his potential – I’d feel confident giving Jones a top-20 grade. Cam Newton and Nick Fairley to declare? Interesting information today via Tony Pauline. He claims soures have told him Auburn duo Cam Newton (QB) and Nick Fairley (DT) plan to declare for the 2011 NFL Draft. It’s wouldn’t be much of a surprise. Fairley is having a tremendous year with nine sacks and an interception already. It’d make sense for him to strike while the iron is hot. Newton is the heart of the team’s success. He’s accounted for 27 total touchdowns and rushed for +170 yards five times this year. He’s the clear front runner for the Heisman trophy. As a fourth year player it wouldn’t be surprising to see him go one-and-done with Auburn, having previously transferred from Florida and joined the JUCO ranks. Statistically they’re having the kind of year you’d expect would lead to leaving college early. They may also appeciate Auburn’s difficulty in repeating success in 2011 if they do, for example, go unbeaten and win the BCS title game. What more would there be to achieve? I’ve currently got Fairley in the 20-32 range, but he’s the hot name at the moment and many have him higher. Mel Kiper has him #8 on his latest big board. I’ve discussed Newton in more detail here and here. I wouldn’t draft him to play quarterback. Clearly he’s a world class athlete with amazing size (6-6, 250lbs). However, he’s got serious mechanical issues as a passer and acts as a run-first QB with Auburn. He’s only completed more than 15 passes in a game once this year and he’s only attempted more than 20 passes twice. He systematically destroyed LSU last weekend, while only passing for 86 yards and no touchdowns. I absolutely could see a team falling in love with the athletic qualities and taking him in round one – but I wouldn’t pull that trigger. Solid TD-INT ratio, but his 56.5 completion percentage is 83rd nationally. Arm and intangibles there, but stock slipping. It’s not a detailed explanation as to why he’s fallen eight places in one week, especially when Ryan Mallett (QB, Arkansas) actually went up from #13 to #10 on the big board after a mediocre performance against Ole Miss when he only completed 13/24 passing for 196 yards including one pick and one touchdown. Inside information? Who knows. It goes to show the state of Locker’s stock at the moment. Nick Fairley (DT, Auburn) is on the board for the first time, going straight in at #8. You can’t ignore his production so far this year and his performance against LSU was simply stunning. However, he’s played well all year so it’s a surprise to see Fairley appear this high out of the blue. Another new face on the board? Justin Houston (OLB, Georgia) who appears at #17. The latest projection is now available and can be found by clicking here or selecting ‘Mock Draft’ in the title bar. Last year I used my weekly mock updates to look at different scenarios. Quite obviously, it’s impossible to predict how things are going to shape up this early. The mocks are really designed to encourage debate and look at how prospects are performing. Because I’m putting out mocks a lot earlier this year, I haven’t really had a chance to cover a lot of different possibilities. That will start from now on. I’m keeping it as a top-20 projection for now but will develop the mock into a full first round in November. Talking point #1 – Buffalo aren’t taking a quarterback? Seriously? In all honesty, I wasn’t surprised Buffalo took C.J. Spiller in round one last year. Not because I liked Spiller (which I did), but mainly because it was the kind of pick Buffalo have been making for a while now. They don’t do predictable. They need a quarterback. They need a left tackle. They need more talent on defense. If I was them and had the first overall pick next year – I’d study Andrew Luck and Jake Locker, decide who is most capable of leading the recovery and make the choice. As I mentioned though – this isn’t an easy front office to work out. I still think a QB is very likely and should be the selection. However, we might as well consider the alternatives over the next 4-5 months until the 2011 draft. If they do decide to pass on a quarterback, Da’Quan Bowers (DE, Clemson) could be the reason why. Buffalo switched to a 4-3 against Baltimore and appear to have given up on Aaron Maybin. Only three teams have less sacks than Buffalo. Bowers is on target for 17 sacks in 2010 and is starting to live up to expectations as a former #1 ranked recruit. Since 1998 when Peyton Manning was drafted first overall, nine quarterbacks have been taken with the top pick. Only three non-quarterbacks have been taken first overall – two defensive ends (Courtney Brown, Mario Williams) and one offensive lineman (Jake Long). With no left tackle worthy of even top-five consideration, the Bills will almost certainly choose between one of the quarterbacks or a defensive end like Bowers. Talking point #2 – Where’s Jake Locker? Since I started my 2010 mock drafts, Jake Locker has been absent only once – following his poor performance against Nebraska. I had him as the #1 overall pick last week – suggesting Buffalo may be wowed by his athletic qualities. However, for every person who thinks Locker should go that high, there are people who aren’t so positive. I’ve spoken to two scouts from established national draft sites in the last ten days. One felt that Locker’s stock was firmly in the 20-40 range. The other told me that he’d spoken to a NFL scout who said Locker wasn’t even the best senior on Washington’s roster. Could he fall on draft day? I can understand why that could happen. Opinion is mixed on Locker – some point out the lack of overall talent on the Washington team and praise the physical and athletic qualities on show. Others say he just hasn’t progressed from last year, rightly point out the number of times Locker has to get out of the pocket to make plays and point to erratic play and sometimes poor decision making. Whether he falls or not will depend on the teams needing a QB who own early picks. Would a team like Arizona roll the dice on another QB after the Leinart experiment? Would they not look for perhaps a ‘quicker fix’ to make use of the talent they have now? Would a team like Jacksonville show interest in Locker when they’ve been determined to create a strong defense in recent years – with a big need in the secondary still prevalent? What free agent quarterbacks will be available – and will we see any big trades (eg Donovan McNabb earlier this year)? Would teams look at a guy like Ryan Mallett who may be around in the second or even third round and fancy taking on that challenge? Will Blaine Gabbert declare? I wouldn’t draft Christian Ponder before round five – but will teams feel differently? It wouldn’t surprise me if Locker did end up falling into that 20-40 range and that’s represented in this latest mock. Talking point #3 – So what about the Seahawks? Seattle is 4-2 and leads the NFC West. If the Seahawks win the division they’ll pick no earlier than 21st overall. It’s the first time since 2008 that I haven’t been regularly mocking Seattle in the top-10. In my opinion, the team’s biggest need is quarterback and it’s not even close. If Matt Hasselbeck makes the Pro-Bowl this year and gets a new contract, nothing changes. If Charlie Whitehurst is sensational in practise or gets an opportunity and does really well – again nothing changes. The simple matter is – whilst there’s no secure planning at the position it’ll always be the biggest need. Hasselbeck remains a short-term fix and Whitehurst is yet to prove he’s a legitimate franchise quarterback. With all that taken into consideration, I think if you have a quarterback on your board with a first round grade when you’re on the clock – you take them. Let them compete and if they’re not ready to start immediately, you invest in the future. When you’re picking in the 20’s… a bust is a bust. If you like the guy enough to take him at all, you take the chance. In this scenario, obviously you’d have to consider Jake Locker who would be a natural fit for the Seahawks offense. What about alternatives? Mike Williams is starting to look like a #1 receiver, but I think there’s still room to improve alongside him at the position. Julio Jones (WR, Alabama) is starting to get it. His occasional mental lapses might cost him the opportunity to go higher, but I think he’s a solid option in the 16-32 range as someone with the physical skills and the right attitude. There would be a number of options on the defensive line. Drake Nevis (DT, LSU) and Nick Fairley (DT, Auburn) both grade in the 16-32 range as well and fit as potential three-techniques in a 4-3 defense. Cameron Heyward (DE, Ohio State) is a bit over rated for me, but is a solid option versus the run and could spell alongside Red Bryant as a more athletic five technique. Von Miller (DE, Texas A&M) and his lack of size worry me and he hasn’t had the same success this year (injuries have played a part). He could, however, be an option off the edge as a specialist pass rusher. Pernell McPhee (DE, Miss. State) and Cameron Jordan (DE, California) could play off the edge, although they might be too big for the specialist LEO role. Some have spoken about potentially drafting a tackle to book end Russell Okung. I think that’s an area that can be addressed later or via free agency, but if it’s a BPA situation it may be considered if other needs like QB aren’t available. Derrek Sherrod (OT, Miss. State) and Nate Solder (OT, Colorado) are still available, but both would be better suited to the blind side. Gabe Carimi (OT, Wisconsin) would be a better fit on the right side, but I remain unconvinced he’s worthy of a late first round grade. Let me know your thoughts in the comments section. Do you agree with the mock projection? Could Da’Quan Bowers go first overall? Will Jake Locker fall in round one? Who should the Seahawks target if they do win the NFC West and therefore make the playoffs? To see the latest Seahawks Draft Blog mock draft click here. The latest Seahawks Draft Blog podcast is available to download below. 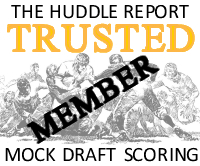 Featured today – can a rising defensive end go first overall? I’ve just finished watching the tape from Missouri’s 36-27 victory over Oklahoma. My main area of focus was Mizzou’s QB Blaine Gabbert. He’s a junior and therefore a potential 2011 draft prospect. I anticipate he’ll return for his senior year unless the hype goes into over drive, but this was a solid performance to knock off the #1 Sooners. On the night he went 30/42 for 308 yards and a touchdown. For the year he’s on pace for 3255 yards and 20 TD’s. If he keeps winning with unbeaten Missouri, people will start talking. Right now I look at Gabbert and appreciate the work he’ll need to do at the next level to become pro-ready. If I had to project his stock I’d put him very firmly in round three, potentially round two. He’s so much better than a prospect like Christian Ponder. He appears to have a better mental make-up than Ryan Mallett. If he did declare for the 2011 draft, he could be the third or fourth QB taken. Another quarterback who is getting hype at the moment is Auburn’s Cam Newton. I talked about him in more detail last week. He’s an amazing athlete, he’s fun to watch. He might carry Auburn to a National Championship and win the Heisman. He is not, however, a legitimate pro-prospect at quarterback. In a close win over LSU yesterday, he again ran more than he passed. He won’t be doing that in the NFL, however good he is as an athlete. When he passed the ball, his footwork was all wrong. When he actually does set his feet, he throws off the back foot way too much and it means his passes lose all velocity. He’s got a much better arm than he shows. I’m not sure it’ll ever be addressed at Auburn whilst they win games. I wouldn’t feel comfortable drafting him early to play QB. With everything that’s happening this year though, it wouldn’t surprise me if he did declare – especially if he did win the Heisman and a big bowl game. He is, after all, a fourth year player who’s spent time in the JUCO ranks after a transfer from Florida. It also wouldn’t surprise me if one team fell in love with Newton the athlete rather than Newton the QB and drafted him in round one. It’d be an unwise move. One player who does look like a first round draft prospect is Nick Fairley (DT, Auburn). He was consistently making huge plays in the 24-17 victory. Despite a breather mid way through the game where he appeared to be a little winded, he was absolutely dominant from start to finish. He abused LSU’s offensive line for pure physical power, showed a decent burst off the line and was permanently in the backfield. He ended the game with three sacks and another big tackle for a loss. That’s nine sacks in eight games for a defensive tackle. Even on double teams he was too much for LSU. 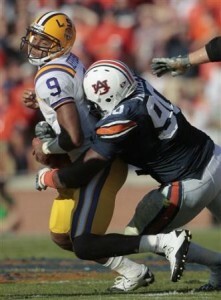 This was undoubtedly a career game for Fairley and one that will propel his draft stock. It’s important not to get too carried away because he certainly isn’t the physically dominating force that Ndamukong Suh was and he isn’t the elite, fluent disruptor that Gerald McCoy was. Suh was a once-in-a-decade time of physical specimen and it’s no surprise that he’s walked into the NFL and continued to dominate lineman. Fairley won’t be able to do that. However, you cannot ignore the numbers. As of today I’d grade Fairley right in the 20-32 picks range. He fits a 4-3 defense as a three-tech, listed at 6’4″ and 299lbs. I will watch Wisconsin vs Iowa tomorrow and have a few notes on Gabe Carimi (OT, Wisconsin) vs Adrian Clayborn (DE, Iowa). I also have Notre Dame vs Navy saved up. –Brandon Harris (CB, Miami) has his first interception of the season in a 33-10 win over UNC. Not many teams have thrown at Harris which has restricted is ability to make too many big plays. He has, however, shown tremendous ability in run support. He could be a top-15 pick. –Da’Quan Bowers (DE, Clemson) just continues to pump his stock up towards the top-5 picks. Another sack this weekend in a 27-13 win over Georgia Tech makes it ten for the year in just seven games. He’s always had the potential to explode into dominance as a one-time #1 ranked recruit. The sky’s the limit for him in 2011. –Andrew Luck (QB, Stanford)helped Stanford edge past Washington State 38-28. He passed for only 190 yards with a 3-1 TD/INT ratio. We’re not going to see Luck dominate a team with the pass unless he comes from behind in a big win. Against opponents like this, Stanford will lean on the run allowing Luck to manage at QB. –A.J. Green (WR, Georgia) is his team’s entire passing offense. Georgia beat Kentucky 44-31 with only 113 passing yards. Green had 86 yards from six catches. He’s a lock for the top ten picks and a contender to go in the top five. –Marcell Dareus (DT, Alabama) and Julio Jones (WR, Alabama)had big games in a 41-10 win over Tennessee. Dareus got his third sack in as many games and is back on top form. He also deflected two passes. Jones had an amazing 12 catches for 221 yards in a much needed big game. This will ease some concerns about his ability to dominate – he has all the tools to be a #1 NFL receiver. –Mark Ingram (RB, Alabama) is watching his star fall at the worst possible time. After missing two games through injury, ‘Bama have split carries between Ingram and talented sophomore Trent Richardson. Neither is on target for 1000 yards rushing. Ingram’s 88-yard two touchdown performance isn’t bad by any means, but the mere factor he won’t even get close to his sophomore achievements might linger with some scouts who feel he’s played his best ball. Even so – if I was picking, I’d still select him in the top-15. -It’s time to start talking about Justin Blackmon (WR, Oklahoma State).He’s a redshirt sophomore receiver who’s on pace for nearly 2000 receiving yards and 24 touchdowns. What’s even more impressive is he got 157 yards and two scores against Nebraska’s dominant secondary. He’s not physically elite in terms of size or speed (6-1, 207lbs) and it’s a favorable system, but there’s something there and he shows good hands when catching, competitive strength to challenge for the ball plus YAC ability. –Jonathan Baldwin (WR Pittsburgh) is also finding form at the right time on a good weekend for receivers. He had 139 yards and a touchdown against Rutgers. It was his best game of the season after a bad situation at QB threatened to destroy his stock. He might be the best wide receiver available after A.J. Green. Ryan Broyles (WR, Oklahoma) looked solid against Missouri, but he’s strictly a slot guy in my opinion and works in a favorable system. He’s a 2/3 rounder. -Not a great day for Jake Locker (QB, Washington) in a 44-14 blow out against Arizona and their backup QB. It started well with a brilliant 26-yard touchdown pass to Jermaine Kearse for a 7-0 lead, but Locker only finished with 17/29 passing for 183 yards and no further scores. I’ve recorded this from last night and will be watching later today. My focus will largely be on how the Bruins manage Oregon’s spread offense, particularly stand out linebacker Akeem Ayers. It’s another chance to watch Gabe Carimi (OT, Wisconsin) manager one of CFB’s better defensive ends. He did a sound job on Ohio State’s Cameron Heyward las week (although I think Heyward is over rated). Adrian Clayborn (DE, Iowa) hasn’t put up the big numbers this year and I’ve read mixed reviews. This is my first chance to watch Clayborn in 2010 and I want to see if he deserves to be classified in that top-15 range next April. This should be a fun game to watch although I suspect Auburn’s offense will smother LSU. Will Cam Newton (QB, Auburn) take on Patrick Peterson (CB, LSU)? I doubt it. Expect to see another 20-25 runs by Newton and another big yardage game. Unfortunately his skills just don’t translate (in my opinion) to the NFL. Despite a rather fortunate unbeaten start to the year, LSU’s quarterback situation is far from ideal. Nick Fairley (DT, Auburn) was this week labelled an ‘elite’ junior by Mel Kiper. I didn’t see that against Arkansas, but this is a much more favorable match up. Blaine Gabbert (QB, Missouri) might end up being the third quarterback taken next April. Right now he’s in that round 2-3 range but he needs to keep winning and he needs to prove he’s capable of making pro-reads. We probably won’t see the latter due to the system Gabbert’s in, but physically there’s not much that holds him back. Can he keep with Oklahoma’s prolific offense? Christian Ponder couldn’t. Ryan Broyles (WR, Oklahoma) is slowly gaining momentum and his 15-catch performance last week continues to push his stock into the late first round/early second. Can Jeremy Beal (DE, Oklahoma) get back amongst the sacks after a rare sackless game last week (18 sacks in his last 19 games). Michael Floyd (WR, Notre Dame) divides opinion. In fact – so does Julio Jones (WR, Alabama) and Jonathan Baldwin (WR, Pittsburgh). One of them may well go in the last first round, but which? Floyd has everything you want from a #1 receiver physically. However, he runs sloppy routes, body catches far too much and doesn’t play up to his physical talents. He needs to step up, like the ND coaching staff have been fighting for all year, to become the prospect he’s capable of being.